I had to post another one of Mel Mel's creations. A couple weeks ago she sent me a little goodie package with the most adorable outfit for Taylor, some cute stars to decorate my house, and a stack of the following thank you cards. Mel knows me well enough to know that I really want to send out hand-stamped thank you cards, but I don't always have the energy to stamp. Not only was I surprised to find these adorable cards in the package, but VERY thankful. Now, what kind of thank you card do you send to thank someone for making you thank you cards? I'll have to work on that one. In the meantime, here is one of my own creations from tonight. I figured it was safe to post them since no one knows which they will be receiving and it might actually shock Mel that I stamped and blogged in one night! I will save the other one for tomorrow night since the white ink is still drying. I need to invest in a heat gun so that the white ink will dry faster! 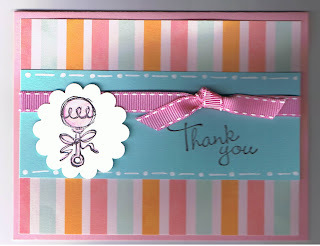 The card is pretty simple, but I need to make quite a few so I wanted cute and I really wanted to use this pink ribbon. I placed a Stampin' Up order to get ready for my open house on Saturday and can't wait to get the new stuff in to play with! After thank you notes my next goal is to start on Taylor's announcements... that will be quite a task too! So my dear friend Melinda(or Mel Mel as I like to call her) has a very funny sense of humor when it comes to my pregnancy. This is the card that I received in the mail yesterday from her. 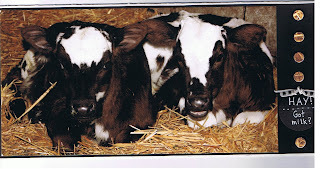 She spent some time a local dairy helping clean up after a wind storm and she had taken some pics while there. I love how creative she is with pictures and creating cards! I laughed so hard when I opened it and saw the phrase! So I thought I would share her cute card with everyone else so that you might get a little laugh too! I'm thinking about making a Lambert family blog so that family doesn't have to sort through my stampings and can just read about baby and our family adventures. The only problem is that I am having trouble coming up with a cute name that includes Lambert. What do you think? 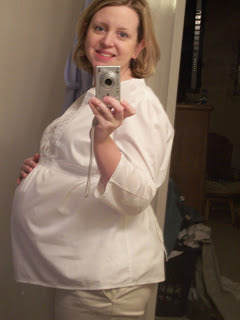 Well that's about it from this pregnant woman. I have my Fort Worth baby shower this weekend and can't wait to see what Kirsten, Desha, and my mom have been up too! Plus it will be wonderful to see all my family in Fort Worth! I will try to post some new pics of Taylor's room next week along with my stamping creations. If your name is Desha then stop here and do not proceed forward! The following pictures are not to be viewed by you until Saturday. I will explain it when I see you. For all others, keep on scrolling because it's finally some of the pictures that you've all been asking for. You've seen the picture from the internet of the bedding, you've seen the Ikea pictures of the furniture. Now.... here is what the room looks like with all those things put together. Keep in mind that we are still working on the room, while doing all the other things required of life. We still have a little ways to go, but at least this way you can see how it's starting to look. I'm still getting used to walking up the stairs and seeing the door open to her room. I got so used to it being closed all the time that it's actually nice to have it open. Now I can't wait until she comes! This is a picture of Taylor's bed with her Under the Sea bedding. I went with a lilac dust ruffle and sheet instead of what came with the set. We are going to use the dust ruffle from the set for the closet curtains. (That's a project still in the works, but check back in a few weeks to see the outcome.) 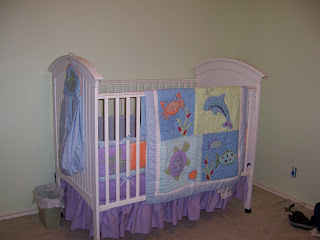 I even put the diaper stacker on the end of the bed to add some more fun sea creature accents. We were planning to put the bed on the purple wall, but the bed stuck out too far when you walked in the door. We are still debating on what to do on the walls, so if you have suggestions I would love to hear them. Some of our best decorating ideas have come from other people! 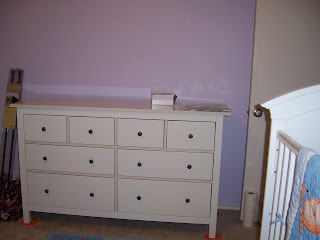 Next we have the dresser on the purple wall. You can see that the wall above it is blank too! I am thinking maybe some of the sea animals from the comforter would look cute here or Taylor's name. I've already started to fill the drawers with diapers, socks, wipes, blankets, and any other little items that we've received already. One of the things that I love most about this dresser is that Ikea sells organizational cubes that fit in the drawers perfectly! They are wonderful for holding Taylor's socks, headbands, and other little items that you never know how to keep organized. I'll have to take a picture for you next time I'm in there with the camera. While you look at this picture, keep in mind that we are going to put a changing pad at one of the dresser so that this can act as our changing table too. I will be spending lots of time here! This is what you see if you look down at the floor from the picture above. 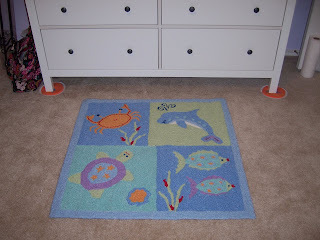 This rug turned out to be SOOO much cuter than it was online! I just love all the colors and the mix of bright and pastel. Look back up at the dresser and then just a little to your left. This is what you will see. 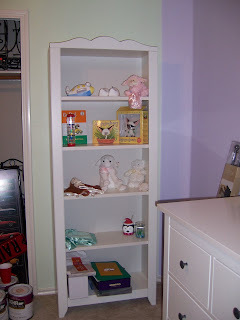 Every child needs a bookcase and I thought this one was too cute! Can you believe that Taylor already has items for her shelves? Don't look at the bottom shelf because that's my 'clean off the top of the dresser' shelf. Yes Gary, that is Taylor's airplane bank on the top shelf and Jefe that is Taylor's wooden shoes from Holland next to it! We have a small shelf unit to hang on the wall near the crib, but it's still downstairs. Once we are 100% this is how we.... wait let me rephrase that to once I am 100% sure this is how I want the nursery Chris will hang the shelf. Items like the shoes will go there so that Taylor doesn't attempt to try them on. Last picture is of Taylor's closet already. 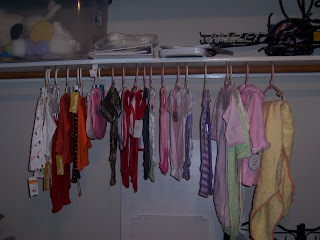 Can you believe that she has 2 more months to go and I've already run out of hangers? I guess that should be expected to make sure that she looks cute all the time. If you were to look more closely at the clothes, you will find not one, but two Texas Tech onesies. She will learn to love Tech from a very early age! Just thought you might get a kick out of the fact that there are still beer signs in the top of her closet. I think Chris is still trying to find a way to tie them in to the nursery theme.